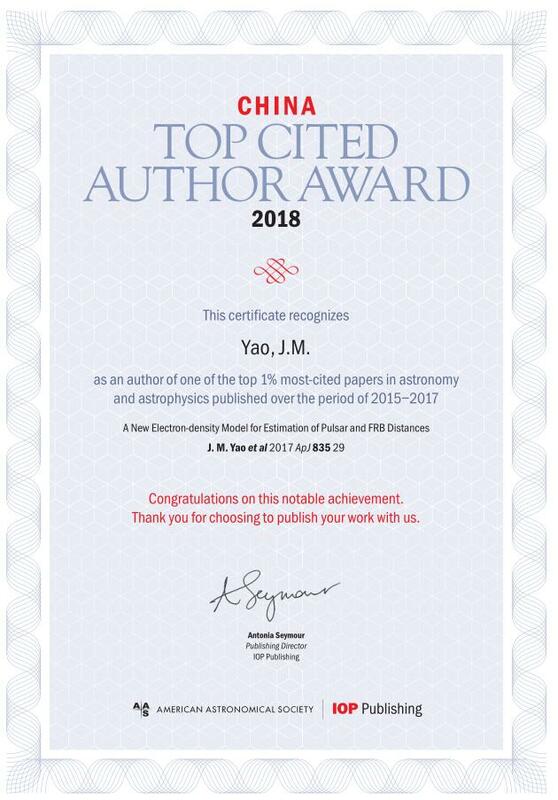 Dr. Yao Jumei, a researcher of Pulsar Group of Xinjiang Astronomical Observatory, won the China Top Cited Author Award by IOP Publishing at the end of August. The title of the academic paper is “A New Electron-density Model for Estimation of Pulsar and FRB Distances”(2017，ApJ,835,29). Dr. Yao Jumei collaborated with Professor R. N. Manchester of the Australian Observatory and Prof. Wang Na of the Xinjiang Observatory to construct a new electron density model for the Milky Way by using the latest measurements of pulsar distance and dispersion. This model is the first model that can be used to estimate the distance between the Magellanic Coulds pulsars and fast radio bursts. It also improves the estimation accuracy of the distance of pulsars in the Milky Way. According to the Harvard University Astrophysics Data System (ADS), the current citation has reached 112 times since the publication of the article in January 2017. The award is for corresponding authors from China, for work published across the whole IOP Publishing journal portfolio in the past three years (2015-2017). The winners are authors of the top one per cent of the most-cited papers in each subject category, which covers Physics; Materials, Biosciences, Astronomy and Astrophysics, Environmental Sciences, and Mathematical Sciences.